Welcome to the new Moar & Butler Funerals website. We hope you find the information and advice useful. Families like you have trusted Moar & Butler with the funerals of their loved ones here in Widnes for more than a century. Although our modern business is constantly evolving and innovating, we’re still proud of our original traditions and values. In 1964, Walter Craven Limited bought the business and has since run the company with the help of a small, dedicated local team for almost 50 years now. So today we can offer all the knowledge and know-how that comes through our affiliation with Craven, the largest independent funeral providers in Merseyside and North Cheshire, alongside the dedication of our colleagues led by Jon Roberts and Robin Daley. Both Jon and Robin have years of experience in helping bereaved families through these tough times. At our two branches in Widnes (Dickson Street and Hough Green), our comprehensive range of services is tailored to you: whether you need a very simple funeral costing just £695.00 or something more complex, a traditional wood coffin or a granite memorial. As well as the personal touches that really a difference: from a bespoke coffin to a cortege route along a special part of the Mersey or special music and readings. We’ll help you create the funeral service that your loved one deserves, including placing an obituary notice, organising the transport of the cortege and advising on the wake venue. 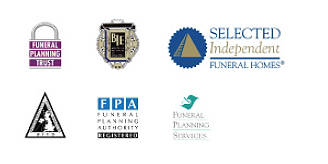 In addition, our award-winning funeral pre-payment plans are well worth thinking about. They’re a practical way to help your family financially when you pass away. Organising a funeral? Click here to send us your details online.